November was a cold month in Seoul, South Korea when one Irish woman and one African American man both faced some discrimination. 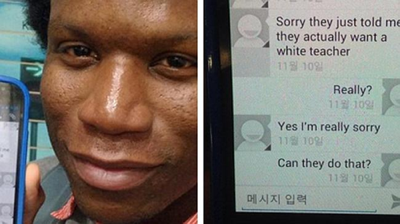 Here's an African American teacher who was denied a job in Korea because of his skin color. Sean Jones was on his way to an interview when he received a message from a recruiter that said, "...they actually want a white teacher." Despite the fact that he had more than two years of teaching experience the school turned him down based on his skin color. 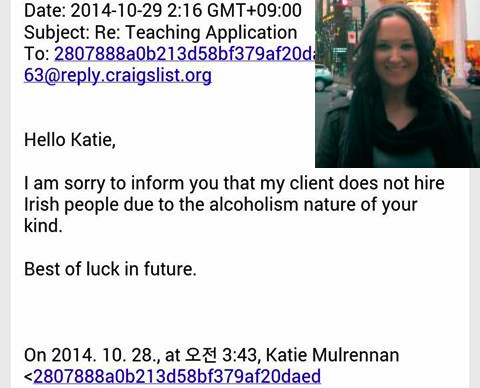 Katie Mulrennan received a rejection letter from a recruiter in Seoul that said, "...my client does not hire Irish people due to the alcoholism nature of your kind." Which is rather ironic as South Koreans tend to be pretty big drinkers. South Korea doesn't actually have the best reputation when it comes to discrimination, but it's not alone. In Eastern Asia this sort of discrimination is common. I have seen job ads that distinctly say that they are looking for a female teacher or a Caucasian teacher in Taiwan and China. I once called about a job while in Korea and the women asked me what the color of my skin was. I said to her, "don't you think that's a little racist?" "Why would that matter?" She said, "it doesn't matter to me, but it does to my boss."